When choosing a career it is important that you find a career that you like since you will be doing it every day. It is also important to find a career that offers you a stable income, a nice work environment and the ability to do something that you love. All this is possible with a career as a radiologist. A radiologist makes a very respectable radiologist income. As a radiologist, it is your main job to image patients that have been sent to you by a physician to see if a patient has a disease or other pathogen that they personally can not check for. The first thing that you will do as a radiologist is to examine the patient’s chart and make sure what diagnostic procedure would be the best for them. Once you have decided on a course of action you will explain this to the patient. You may have the patient to drink a substance or it may be injected depending on the procedure that is being performed. After the patient is imaged, the radiologists job is to look over the images and diagnose any diseases or problems that the patient may be having. This is then discussed with the patient’s doctor and a course of action is decided upon. Further radiation may be needed. A career as a radiologist offers a very substantial radiologist salary together with good benefits. The current average in the US is around $362,000 yearly. However, the amount that you make will depend on several factors such as the place that you work at, the type of specialty that you work under and even the region that you work in. The radiologist salary can vary a lot. Some radiologists can make as much as $400,000 per year. The top states to work in that offer the best radiologist income are Texas, California, Florida, New York and Georgia. The average radiology salary in these states can be as high as $435,000 per year. Before you can get started on your career as a radiologist you will need to complete several years of college and training. This is why you make such a nice radiologist salary. First you will need to obtain a bachelor’s degree in math or science. Next you will go to medical school. Once you have been accepted the training and education will be divided into two sections. The first half will consist of classroom and lab work. The following two years will consist of on site clinical rotations so that you can put your learning to practical use. Once you graduate from medical school you will need to complete a five year residency program. This will consist of one year of general residency and four years of specialized residency. Once you have completed your residency you will now need to take the exam to become certified with the ABR. Each state has different requirements so check with your state to make sure that all requirements are met. As a radiologist, you will have the chance to have a job in which you will be able to be proud of what you do each day. The work environment for a radiologist is similar to that of many types of other doctors. 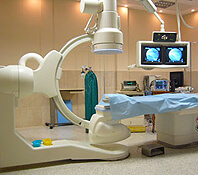 The majority of radiologists work in hospitals and doctor’s offices. The main work schedule will include forty hours of work each week. This is typically a five day work week. Although, many may be required to work over the weekends or after hours especially if you work in a hospital. Some radiologists can work as much as 55 hours or more per week. Radiologists typically work with very sick patients such as cancer patients so they must have a good understanding of emotional stress and how to deal with it. You may also be on your feet a lot of the day too. Proper safety procedures must be followed at all times since you will be working with several types of machines that can be harmful if not used in the correct way. The job of a radiologist can be one of the best jobs out there. But it is very important to understand that it is not the job for just anyone. Going into this career is not advised if you are just interested in the high radiology salary. This is a job in which you will need to have many years of training and dedication before you can even start to practice. It is also a job in which you will need to have a good understanding of people and be able to work well in a team environment. Also, having a good bedside manner and being able to put patients at ease will be a large part of your job. If this sounds like you, then this may be the perfect job for you.